It is said, “Vocations are a mystery,” and for Sister Moe, this was certainly true! Looking back over 50+ years at many wonderful chapters, even some dark chapters, she harbors nothing but gratitude for all the things those life lessons have infused in her spirit. Born and raised in Portland, Oregon, the second oldest of four siblings and the only daughter of Rose and Jay Oliver, Moe attended Holy Redeemer School and St. Mary’s Academy. Moe’s four brothers Mack, Pat, Kerry and Denny and their families remain her most sustaining joy. While her mother was adamant that she not become a nun, her Dad prayed every day that she would. Moe considers her family, the diverse cast of characters and the typical and not-so-typical issues of family life, the foundation for her commitment to serve others. During those early years, it was clear Moe had learning challenges. While she “aced” CYO sports, the only good grades on her report card were in spelling and PE! So why enter a teaching community? It was the spirit with which the Holy Names Sisters related to kids, always exuding happiness in teaching and in being with each other that drew Moe to these remarkable women. Gaining that first teaching certificate was a monumental achievement and from there she made her classrooms a fun learning environment and a happy home away from home for many kids. She began student teaching at St. Ignatius, Portland, then moved to St. Joseph’s, Salem and St. Vincent’s, Salem, before moving to O’Hara Catholic School in Eugene where she taught 1st and 2nd grades for 10 years before becoming principal there. She returned to Portland to serve as principal at St. Ignatius School for 12 years and finally as principal at St. Clare School, Portland for 10 years. In each school, Moe established full classroom computer labs and advanced technology in teaching and learning. She also served on the boards of St. Mary’s Academy, Mary’s Woods and Namasté. 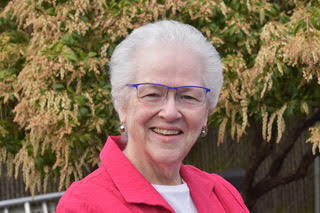 Now retired, Moe assisted the Oregon Food Bank with development for nine years, continues to teach women’s spirituality classes at Coffee Creek Correctional Facility in Wilsonville, Oregon, and volunteers at St. John Fisher School, where five of her 10 great-nieces and nephews attend school. God is in all things, and though God can seem elusive at times, Moe has come to experience the breadth of God’s love from knowing family and friends, living ministry experiences, enduring heartache and tremendous joy, and in capturing all the ways we live life. We don’t just get through it, we are blessed by it! It is with pure joy and gratitude that she celebrates these 50 years as a Holy Names Sister and continues the journey!